It’s Speedy Tuesday! 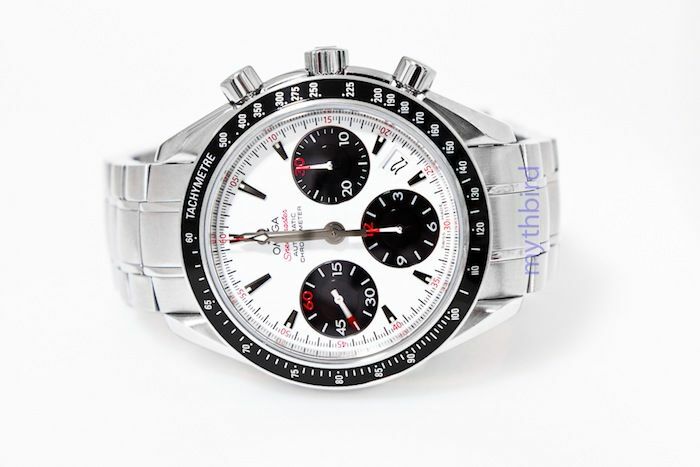 Today we have an OMEGA Speedmaster Date reference 323.30.40.40.04.001 or ‘Panda Speedy’ as the owner calls it. 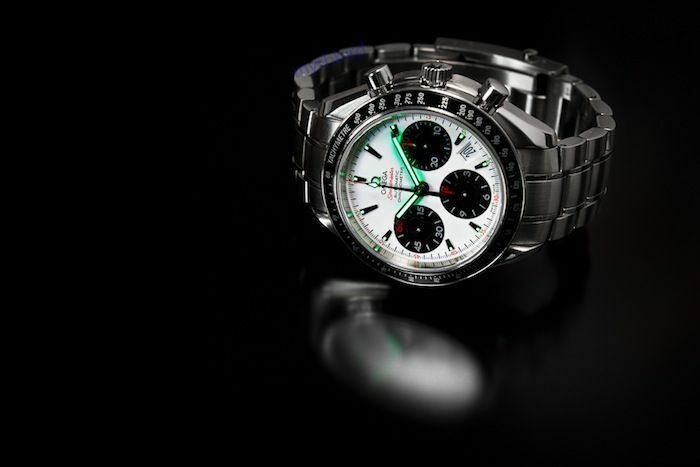 OMEGA has been using these ‘Panda’ dials in different models, including the Speedmaster Professional (Apollo 11 35th Anniversary edition in 2004 and the Speedmaster Mitsukoshi edition for the Japanese market in 2003). This Speedmaster Date also has a white dial with black sub registers, looking like a Panda face. As you can see, the Speedmaster Date case is not much different from the “Moonwatch” with its brushed sides and polished facets on the lugs. The 40mm case is just slightly smaller than the “Moonwatch” / Speedmaster Professional and makes it a comfortable watch to wear for everyone. The red accents on the dial reminds us a bit about the OMEGA Speedmaster Legend. The owner of this watch is Peng Bin Teo, he is a watch enthusiast and shares his watches on Instagram as ‘Mythbird‘. He loves to change straps on his watches (including on his Speedmaster Date) and has shared a bunch of different variations on his Instagram account. 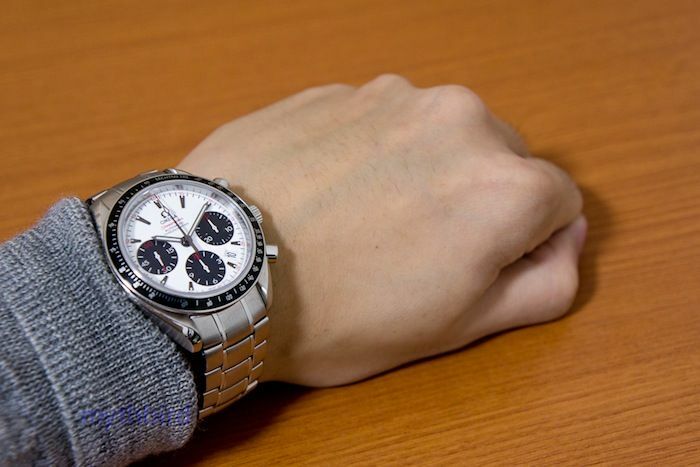 The design of the stainless steel bracelet that came with the watch appears to be identical to the Speedmaster Professional bracelet. Brushed links with small polished links next to the center link. A design that OMEGA has since the late 1990s. The movement that OMEGA uses for their Speedmaster Date collection is the OMEGA caliber 3304 movement. This movement is based on the ETA/Valjoux caliber 7753. A solid designed movement that has been there for ages. This movement does not have a Co-Axial escapement (yet) and remains one of the few without. OMEGA is not the only brand with watches that are being nicked ‘Panda’. Of course we know about the Rolex Daytona dials that have this nickname as well and how about the Audemars Piguet Royal Oak Offshore ‘Panda’? It seems to be a generic method to point out a white dial with black sub dials. Besides this model, the Speedmaster Date collection comes in a variety of dials, as you can see here. A big thanks to Peng Bin Teo for playing along on Speedy Tuesday.